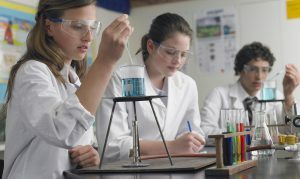 Girls from well-off families are just as likely to study Science, Technology, Engineering and Maths (STEM) subjects as boys – but gender divides persist for less affluent young people. Researchers at the UCL Institute of Education analysed information on more than 4,000 members of Next Steps. They compared your choice of A-level and university degree subjects to your socioeconomic circumstances, gender and ethnicity. STEM and other subjects, including social studies, law and business (SLB) are known to lead to certain advantages in the labour market. Policymakers and educationists have been concerned with the unequal take-up of these subjects among young people of different backgrounds. Boys were more likely than girls to study STEM subjects at both A-level and university. However, gender divides were most evident among pupils from lower and middle socioeconomic groups, and appeared to grow between secondary school and university. Among less affluent pupils, boys were more likely to go into STEM degrees at university, whereas girls were more likely to study SLB subjects. This was true even when taking into account prior educational attainment. Boys and girls also appeared to be affected differently by their socioeconomic circumstances throughout their education. Social class – determined by parents’ occupations – was not related to A-level subject choice for boys or girls. However, when it came to picking university subjects, boys from working-class homes were just over 80 percentage points more likely to choose STEM subjects than their equally-able peers whose parents were professionals or managers. Social class was not related to girls’ degree choices. While both girls and boys degree-educated fathers were more likely to study at least one STEM A-level, parents’ education affected girls’ and boys’ degree choices differently. Boys who had at least one parent with a degree were less likely to choose STEM and more likely to choose arts and humanities subjects at university than equally-able boys whose parents did not have a degree. For girls, those whose mothers were degree-educated were less likely to study SLB subjects than equally-able girls whose mothers did not have degrees, but more likely to study either STEM or arts and humanities subjects. Fathers’ education does not appear to influence young women’s degree choices. Interestingly, family income was not related to subject choice for boys or girls at any age, once the pupils’ prior attainment and other socioeconomic factors were taken into account. In line with previous research, minority ethnic pupils were more likely to study STEM and SLB subjects than their white peers at both A-level and university. The differences were even greater when taking into account the young people’s socioeconomic circumstances and prior attainment. “If policymakers are interested in increasing participation in STEM subjects, there is no doubt that encouraging higher attainment for less advantaged young people will have an impact,” the researchers say. “But given that other socioeconomic factors – in particular parents’ education – carry an influence over and above prior attainment, this will not close the gap entirely.